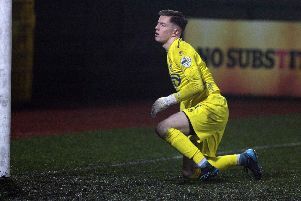 Derry City manager Peter Hutton has confirmed that goalkeeper Gerard Doherty is doubtful for tomorrow night’s home clash against champions Dundalk. The net-minder has a hip problem and will have a late fitness test ahead of the game. Another man who is likely to miss out is striker Anthony Elding who continues to struggle with a calf injury, Stephen Dooley is also out with a back problem, while Seanan Clucas’ clearance still isn’t sorted, so he too could miss out again. On the plus side duo Ryan McBride and Mark Timlin return from suspension and Seamus Sharkey is also in the squad after training this week. Incidentally tommorrow evening’s game will be live on both Radio Foyle and Drive 105’s Match Night Live from 7.30pm.